Walk and experience the natural and cultural history of the De Hoop Nature reserve and Marine Protected Area with a qualified nature/marine guide. 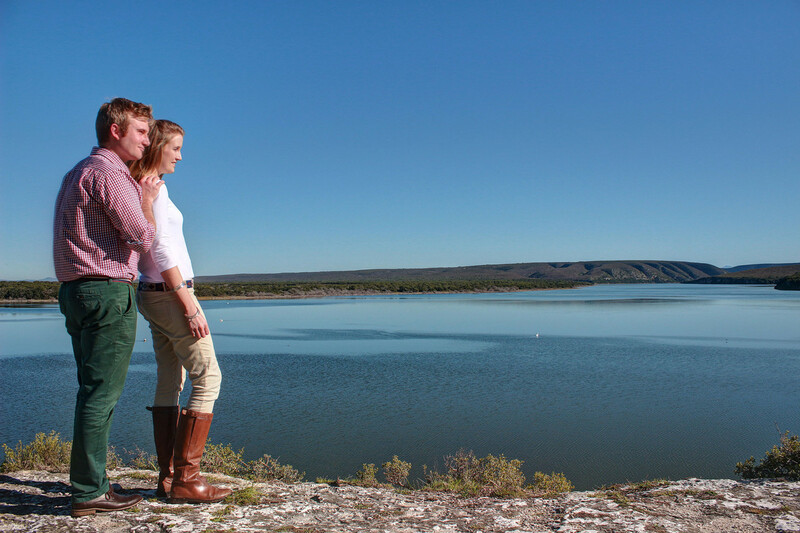 There are many natural wonders in the world but only a few with such awesome diversity – De Hoop, The Jewel of the Cape. 14h00: Check-in at the De Hoop Opstal reception. Guests will be met by their guide who will be accompanying them for the duration of the stay. After settling into the accommodation, a briefing of the next three days together with a short historical walk will take place. After a wholesome evening meal in the restaurant guests explore the night sky with an informative star gazing activity. Time subject to weather and seasonality. 08h00: Breakfast in the restaurant. 09h00: An interpretive walk takes Guests along the De Hoop Vlei, and surrounding Fynbos, with emphasis on the Birdlife associated with the wetland, a one hour break will be enjoyed around midday for a picnic style lunch at a special location. Thereafter, a leisurely walk on a circular route will bring you back to the Opstal. 19h30: Dinner in the restaurant. 08h00: Breakfast served in restaurant. 09h00: A vehicle transfer (or Bicycle option) to a site on the coastline, where you will have the rare opportunity of exploring the wonders of the pristine rock pools. Your guide will unveil the relationships and interactions of the many marine creatures found in the intertidal zone. 13h00: Picnic lunch at the coast. 16h00: Return to Opstal for an afternoon at leisure. 19h00: Dinner in the Boma. 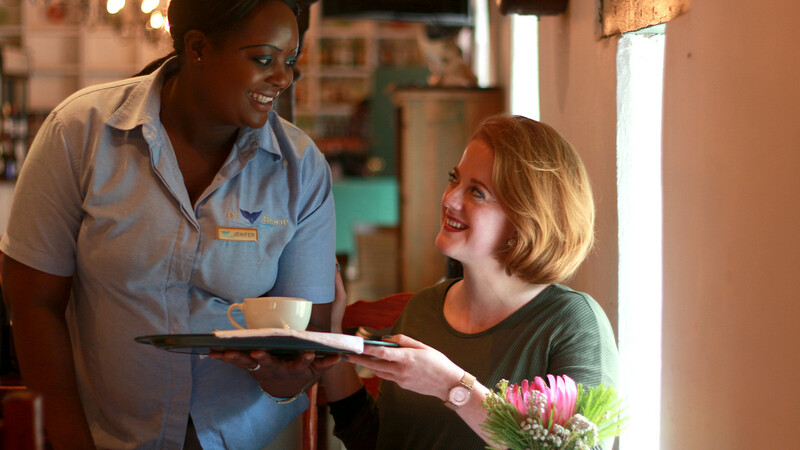 Situated at the main Opstal area, the De Hoop Collection’s Fig Tree Restaurant offers day and overnight visitors a welcoming and comfortable setting in which to enjoy local cuisine. 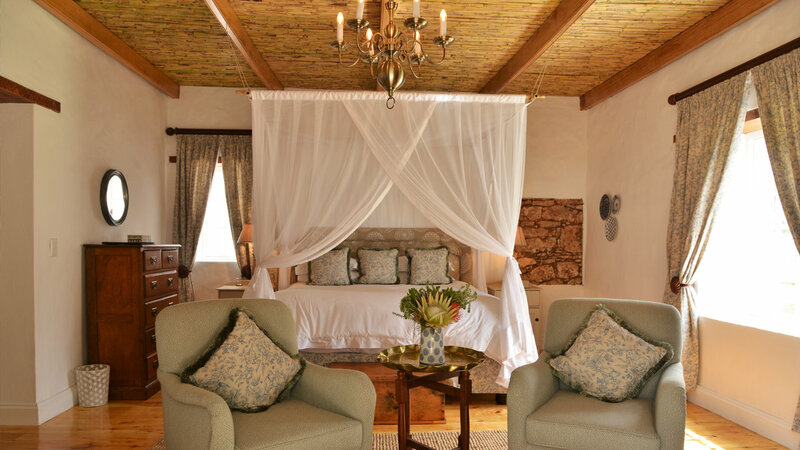 The building that dates from the 1800’s was built by farmer Cloete as his sheep shearing shed and renovated by De Hoop Collection to a warm, cosy restaurant. Stay at the Opstal, in a luxury Suite or the stunning Opstal Manor House. Our brand new suites are beautifully decorated and sleep 2 guests each. Each suite has an en-suite bathroom, tea & coffee facilities and bar fridge. The Opstal Manor House is the original homestead which has been restored to its former glory. The house has 2 large en-suite bedrooms and 1 small en-suite bedroom suitable for kids. A cosy lounge with fireplace and the old stone floor kitchen is shared between guests. Tea & coffee making facilities are available in the kitchen. 1 500 plant species is amongst the highest in the Cape Floristic Region, with a large percentage of rare, threatened and endemic species. The discerning visitor is privileged to walk amongst pristine fynbos vegetation and view the flowering plants at close quarters. The invertebrate animal wealth is equally diverse. A safe refuge is provided for rare mammals such as the Bontebok and Cape Mountain Zebra, smaller predators and various Bat species, approximately 260 bird species have been recorded including the rare Damara and Caspian terns, the vulnerable Cape vulture and Stanley’s bustard. The De Hoop Marine Reserve is one of the world’s most important calving grounds for the southern right whale and an important nursery area for depleted angling fish species. From a cultural-historical perspective, visitors experience a bygone era. The historical homesteads at De Hoop, Melkkamer and Potberg are well-preserved architectural examples and many of the previous landowners maintain life-long sentimental ties with the reserve. The De Hoop Nature Reserve has a diversity of values for people, from practical to aesthetic, from watershed protection to spiritual inspiration. It is a magnificent outdoor classroom, offering spectacular walking opportunities for visitors. The De Hoop Vlei is 17km long and a highly productive ecosystem; a Ramsar site of international ecological importance where aquatic birds and other organisms breed and feed undisturbed. Many of the 260 bird species which occur at De Hoop can be seen here. The vlei boasts several pairs of African fish eagles. Their high-pitched call, the voice of Africa, contributes to the wild charm of the area. The area is a safe shelter for twelve waterfowl species during the dry summer months. As many as 13 species of migrant waders including curlew sandpipers, ruffs, little stints, whiskered and white winged terns visit the vlei in summer, when the water level drops and the mud flats are exposed. The De Hoop coastline is gently concave and faces the broadest part of the southern African continental shelf, the Agulhas Bank. Varying sea temperatures, high wave energy and the meeting of the cold Benguela and warm Agulhas currents along this coast contribute to a variety of habitats, with a diversity of marine organisms. The spectacular occurrence of the Southern right whales every year June – September makes this an exquisite location. A minimum of 6 persons and a maximum of twelve persons aged 12 and older may participate. A reasonable level of fitness is required, however the walking pace is leisurely and an interpretive experience with the natural environment. The general rules and regulations of Cape Nature and De Hoop Nature Reserve will apply and indemnity documents will be completed before participating. The package incorporates birding, game viewing, Fynbos and marine experiences on foot. Dinner and Breakfast is included in the package and is served in the Fig Tree Restaurant. De Hoop Collection Terms and booking conditions apply. all scheduled meals, hot/cold teas, coffees and juices. Rate excludes cool drinks and alcoholic beverages. All activities are weather and tide dependant. This itinerary is only an indication of what can be expected on the trail. Your guide will advise times of activities. A warm jacket is recommended in summer and winter months. Comfortable walking shoes with ankle support. Sandals with rubber soles are useful on the coastline. The trail provides for all bedding, linen and towels.